Measurements by the Ulysses GAS experiment of interstellar helium atoms have provided the most accurate determination of the velocity of the Sun with respect to the local interstellar medium (26 kms-1) and of the temperature of the local interstellar gas (6500 K). 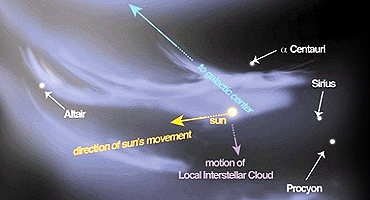 The Sun and the nearest stars move through filaments of galactic clouds (Copyright P. C. Frisch, University of Chicago). Interstellar pickup ions measured by the SWICS experiment on Ulysses are being used to deduce the density and degree of ionization of the gas in the Local Interstellar Cloud (LIC) surrounding the heliosphere. Ulysses SWICS data have been used to study the composition of elements in the LIC. It seems that the heavy elements Nitrogen and Oxygen in the present-day LIC are under-abundant compared with their abundance in the protosolar cloud. This is just the opposite of expectations. Galactic evolution over the last 4.6 billion years should have enriched the abundance of heavy elements in the LIC gas compared to that in the protosolar cloud. On the other hand, the abundance of neon in the LIC measured by Ulysses appears to be equal to or even higher than its solar abundance, which would be more consistent with expectation.